With a good dump of snow on the ground everyone was in the shop for the day except for the giant snowball fight at second coffee break. The tool trailer was emptied of a months accumulation of tools and assorted all kinds of stuff. That doesn't make much sense but that what was in there and LOTS of it too. In the shop the sign tree was finished today. It sure looks great! Well done Jenessa and Hailey! The water tower timbers got their coat of fiberglass reinforced concrete today as well and were sculpted to look like old weathered wood. It was a group effort and is looking pretty cool. 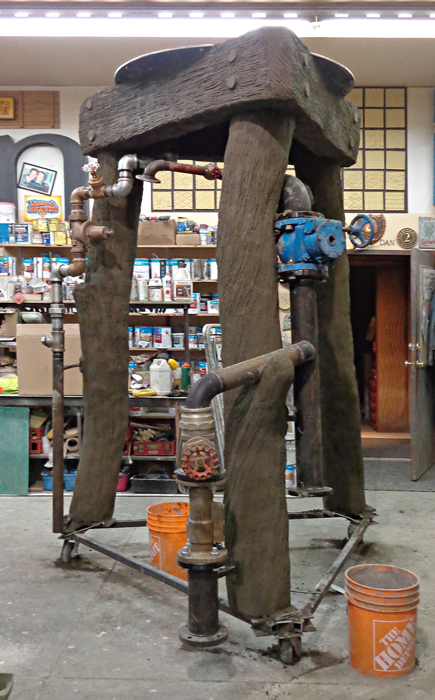 The tank for on top of the water tower got its final coats of base colors and glazes today. Getting it done was a real push as quitting time quickly approached. Everyone jumped in to finish the task. It's been a great week, both up at the work site and in the shop. Two more work days until the Christmas break. Everyone is getting very excited!